A tonsillectomy is the removal of the tonsils. Tonsils are nodes found in the back of the throat. Removing the tonsils may decrease the number of throat infections. Some tonsils can also become enlarged. It may cause obstruct the flow of air. One example is sleep apnea. Factors such as weight or chronic disease may increase your child’s risk of complications. Teens who engage in tobacco, alcohol, and/or drug use may also increase their risk of complications. Talk to your child’s doctor about all medications your child uses. Your child may need to stop taking some medications prior to the procedure. General anesthesia will be used. Your child will be asleep during the procedure. The procedure is done through the mouth. Once your child is asleep, the doctor will grasp each tonsil with a special tool. The tonsils will then be cut away from the surrounding tissues and removed. The tonsils may be cut out with a scalpel, hot knife, or laser. A hot knife or laser will help seal the incision as the cut is made. An electrical current or clamps and ties will be used to stop bleeding at the site. Anesthesia will prevent pain during surgery. Pain and discomfort after the procedure can be managed with medications and soft foods. In most cases, your child can go home the same day. Other times, an overnight stay may be necessary to make sure your child is recovering as expected. Right after the procedure, your child will be in a recovery room where their blood pressure, pulse, and breathing will be monitored. Recovery may also include pain or anti-nausea medications. Home care will focus on controlling pain and nausea with medications and soft foods and soothing or cold fluids. It may take a couple days before return to normal activities. Throat, ear, or jaw pain may last for up to a week. Call for emergency medical services right away if your child is bleeding excessively or has difficulty breathing. Ingram DG, Friedman NR. 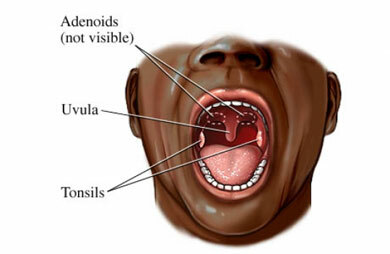 Toward Adenotonsillectomy in Children: A Review for the General Pediatrician. JAMA Pediatr. 2015 Dec;169(12):1155-61. Tonsillectomy. Cincinnati Children’s website. Available at: https://www.cincinnatichildrens.org/health/t/tonsillectomy. Updated January 2017. Accessed January 11, 2019. Tonsillectomy. EBSCO DynaMed Plus website. Available at: http://www.dynamed.com/topics/dmp~AN~T114262/Tonsillectomy . Updated June 21, 2018. Accessed January 11, 2019. Tonsils and tonsillectomies. Kids Health—Nemours Foundation website. Available at: http://kidshealth.org/en/parents/tonsil.html. Updated May 2013. Accessed January 11, 2019.